Happy Monday everyone! I thought your Monday could use something bright and sunny with all the cold and snowy weather that’s been traveling across the country. What better way to do that then to share a recipe for Grapefruit Curd and Honeyed Yogurt Parfaits! Now I’m sure many of you have had lemon curd before and if you are anything like me you could just eat the stuff with a spoon! Well, with grapefruits being in their peak season right now I thought I would change things up and make grapefruit curd instead. I am so happy I tried making it because this is some darn good curd! To make the grapefruit curd I used sweet and delicious Florida grapefruit! Unlike most fruit, Florida grapefruit’s peak season is right in the middle of winter (January-March). The unique fertile soil and lush subtropical climate are what make Florida grapefruit the sweetest and juiciest variety of grapefruit in the world! The downside to the unique climate conditions is that they can take a toll on the outer appearance of the grapefruit, so don’t judge a book (or fruit) by it’s cover! Grapefruit is a great fruit to eat during the cold winter months when cold and flu viruses are floating around. Did you know that half of a Florida grapefruit contains 100% of the recommended daily amount of vitamin C? All the vitamin C along with the generous dose of fiber and potassium makes the grapefruit a great choice for snacking! Making the grapefruit curd is quite simple. In a small saucepan add the sugar, eggs, and grapefruit zest. Heat it through, whisking constantly until the sugar is dissolved. Next add in the grapefruit juice and continue whisking until the curd thickens. To ensure that the curd is perfectly smooth, pour it through a fine mesh strainer. Let the grapefruit curd chill in the fridge for at least a few hours. 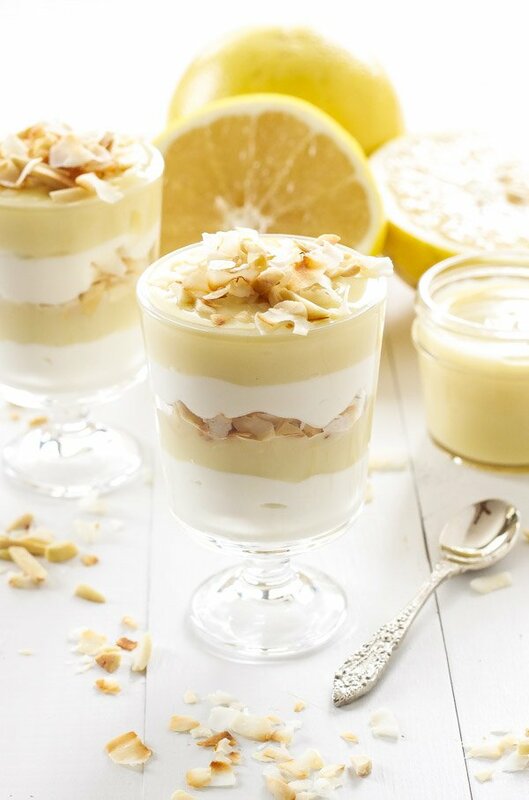 Once the grapefruit curd has chilled you can assemble these delicious parfaits! Start by mixing together plain non fat Greek yogurt with a bit of honey for sweetness. Spoon some into a glass then add some of the grapefruit curd on top. Because I love something crunchy in my yogurt parfaits I added toasted unsweetened coconut and slivered almonds. I loved the tropical taste it gave the parfait, just what I needed to brighten up the cold winter day! 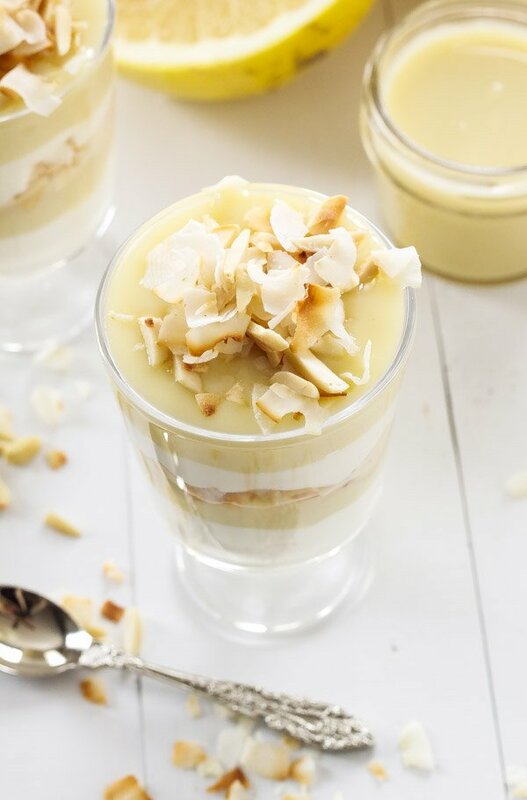 Continue to layer the parfait ending with the grapefruit curd, toasted coconut, and toasted almonds on top. Not only are these Grapefruit Curd and Honeyed Yogurt Parfaits a delicious snack, but a healthy and filling one as well! 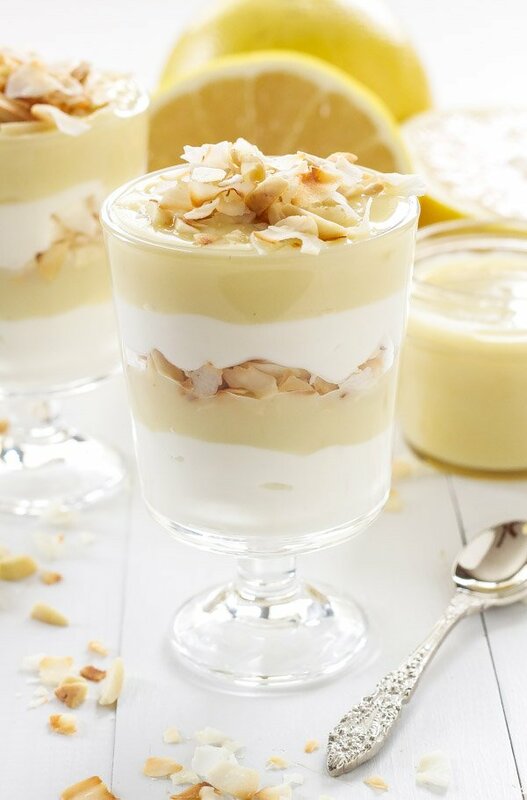 Layers of grapefruit curd, Greek yogurt, almonds, and coconut come together making a delicious and healthy parfait! In a small saucepan over medium heat, whisk together the sugar, egg, egg white, and grapefruit zest until the sugar has dissolved, about 3 minutes. Pour in the grapefruit juice and whisk constantly until the curd has thickened, about 5 minutes. Pour the grapefruit curd through a fine mesh strainer, then cover and refrigerate it for at least 3 hours. When the grapefruit curd has chilled remove it from the refrigerator. In a small bowl whisk together the Greek yogurt and honey. In 2 glasses or bowls starting with the honeyed yogurt, layer 1/4 cup of the yogurt, 1 tablespoon of the grapefruit curd, 1 tablespoon of the toasted slivered almonds, and 1 tablespoon of the toasted coconut. Repeat the layering process ending with the grapefruit curd, toasted almonds, and toasted coconut on top. These look so creamy and delicious! Grapefruit is definitely my favorite, and the curd in this sounds to die for! Thanks Melissa! The grapefruit curd was perfect mixed with the yogurt, almonds, and coconut! Grapefruit curd, such a creative idea! I definitely need to try this! Thanks Lisa, I loved it! 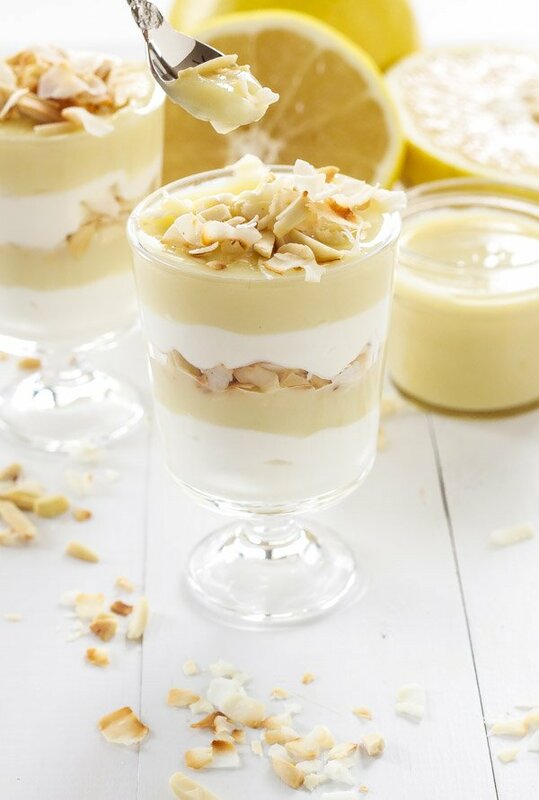 These Parfaits are so awesome, and your addition of grapefruits and curd sounds absolute YUM! I eat grapefruit every day and am always looking for new recipes to try! I love that you made grapefruit curd. 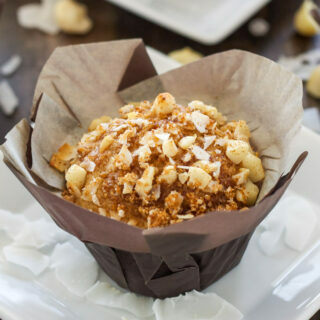 The coconut and almonds add the perfect crunch! Thanks Ashley! You are so lucky you live in Florida and have it perfectly fresh all the time! So beautiful!!! I love curd, especially, lemon curd, but I've never had grapefruit! 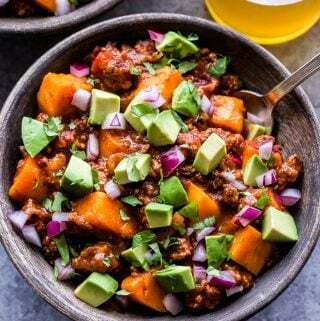 Definitely something I need to try! Thanks Nicole! I love changing up flavors of curd and grapefruit was perfect to try this time of year! These grapefruit parfaits look unreal! 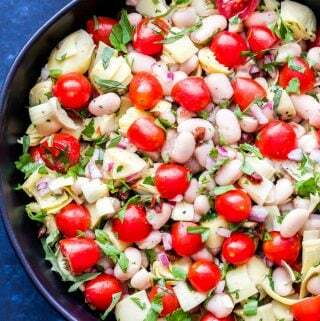 Loving the colour and the perfect layers.. wish I had one to devour now! Thanks Thalia! I could barely wait to finish taking pictures before I inhaled one! I love grapefruit, but never had grapefruit curd! These parfaits look cute and delicious! Great flavors! Thanks Mira! Grapefruit curd is a must try!